I, therefore, looked on with interest when it changed hands and was subject to a revamp by the new owners. It certainly was in need of freshening up, but would it lose much of its old (albeit somewhat jaded) charm I wondered. They have certainly spruced the place up a bit from its rather tired previous incarnation. 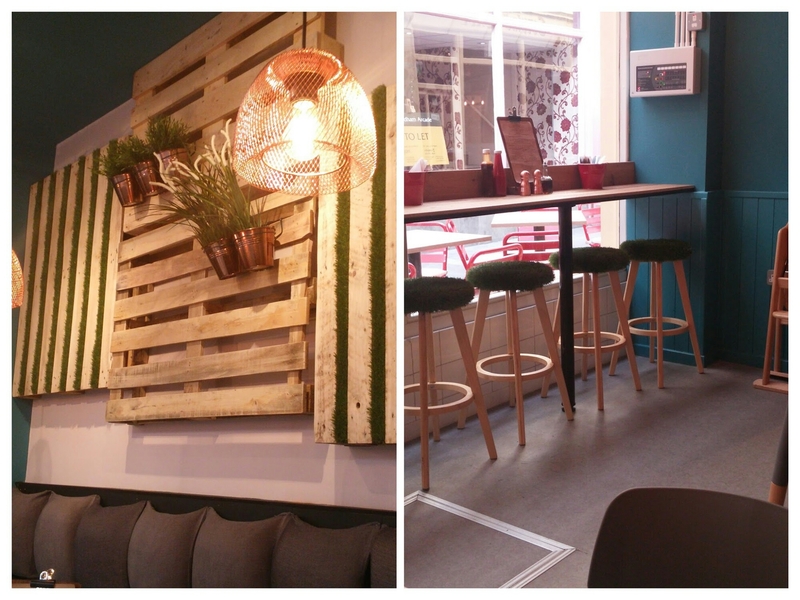 Whilst where we were sat was quite comfortable, I was not at all sure about the pallets stuck on one of the walls and, in particular, the astroturf covered stools. What is that all about? Bar perhaps from the rather odd turf on the stools, they have done a pretty good job with the face lift though. On arrival we perused the interesting looking menu, with its mix of all day breakfast items (including fry ups and posher egg dishes), baguettes, sandwiches and toasties, as well as diner/greasy spoon classics (under winter warmers, such as corn beef hash and proper “not plastic” ham, egg and chips). After a bit of indecision, we (the usual work reprobates) ordered a corn beef hash (me), a gravy soaked beef and crispy onion ciabatta and a tuna and red onion ciabatta, as well as a couple of portions of chips (the latter double order based on the waitress telling us it was a small portion). Whilst the drinks came quickly (coffees all around) we waited and then waited some more for our food as the lunch hour slipped inexorably by. There seem to be little sense of urgency in the clearly visible kitchen and prep area and it wasn’t that busy. We waited a good 45 minutes before our food finally arrived and came perilously close to walking out due to an impending meeting (we gave ourselves 1 hour 30 from leaving the office which should have been plenty). Less entertaining company and I would have been gone. Teething problems hopefully, but timing is something they need to get sorted quickly as most people has less leeway for their lunch “hour” than I do. You can forgive these things (new place, bedding down and all) if the food is top notch. Sadly this was not the case (at least on my visit). After the wait, I was starving and was a little disappointed with the size of my corn beef hash (although it was only £5.95). 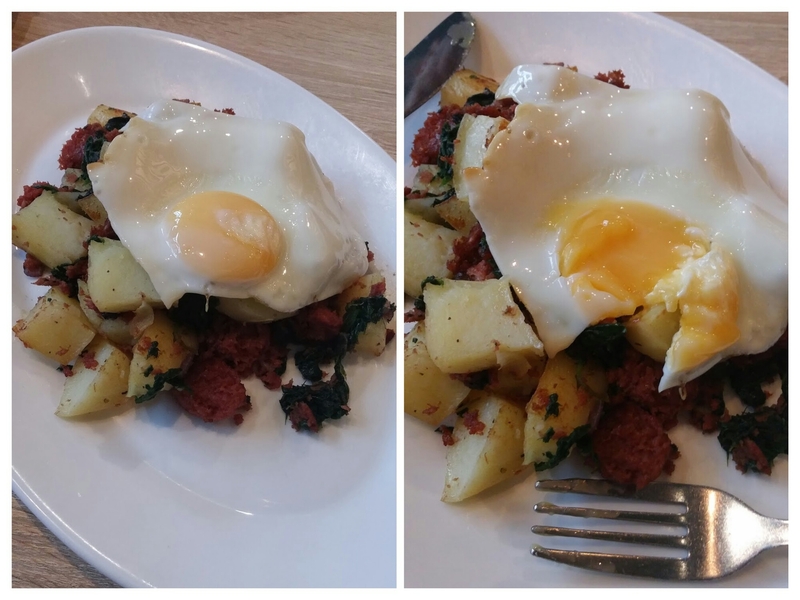 This disappointment got worse when I realised my fried egg wasn’t runny (cardinal sin with a hash, as part of the joy is that gooey yolk running into the hash mix) and that the potatoes were far from the required crispy and, in fact, a tad too al dente for my tastes (I like most veg. al dente, but not potatoes ). The corn beef element of the hash was nice enough and there was some nice greenage in it, but it was marred by the egg and potato issues. Bearing in mind the time it took to arrive it was disappointing (to say the least) that one major element was underdone and another overdone. They made a bit of a hash of it, if truth be told. The gravy soak beef and crispy onion ciabatta (£4.25) sounded promising (a British version, perhaps, of that classic the French Dip). Tender, melt in the mouth, beef smothered in a proper gravy sounds fab doesn’t it. Sadly this again disappointed. 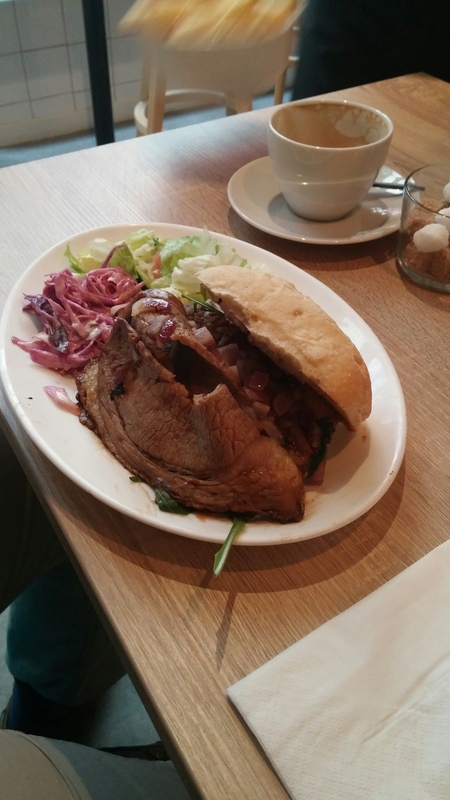 Whilst there was plenty of the beef, it was somewhat chewy. Nice gravy though. 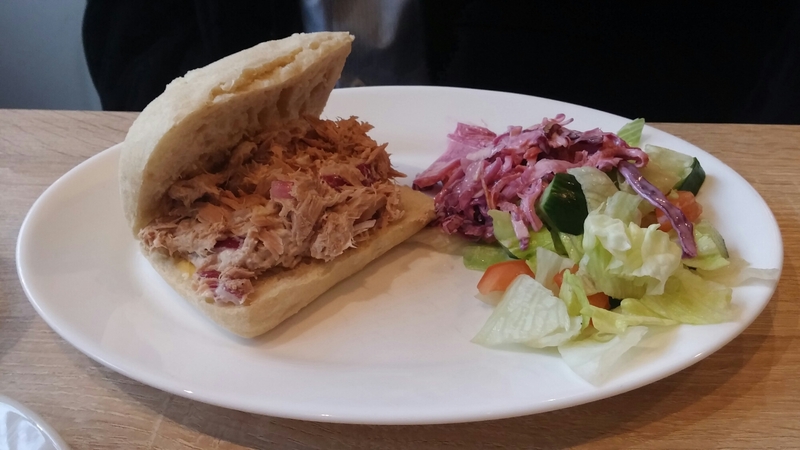 Only the tuna, red onion and rocket ciabatta (£4.25) passed muster and in reality as long as the tuna is OK you can’t really bugger that up. 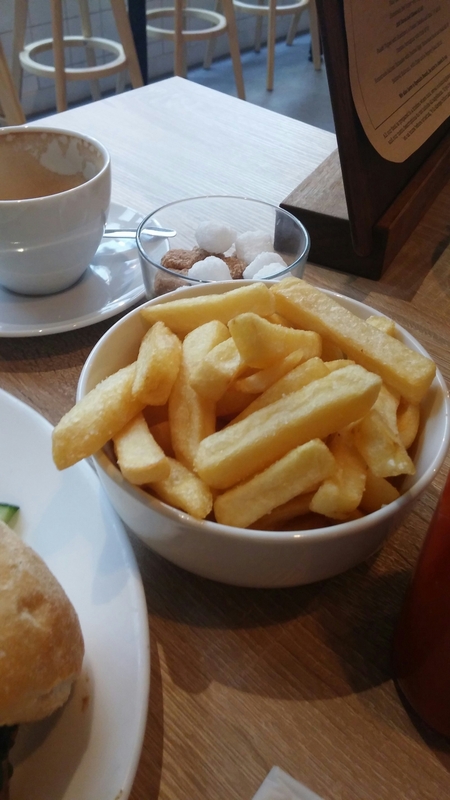 As indicated above, two bowls of chips (a very reasonable £1.25 per portion when ordered with a sandwich) were ordered (based on the waitress indicating one between two was not enough and me expecting my hash to be more substantial). These were fine if lacking crispiness, but we didn’t need two. On the drinks front they have the usual soda suspects and more interesting ones (Fentimans), as well as booze including beers, wines and (somewhat ambitiously in my view) breakfast cocktails (Bloody Mary etc). 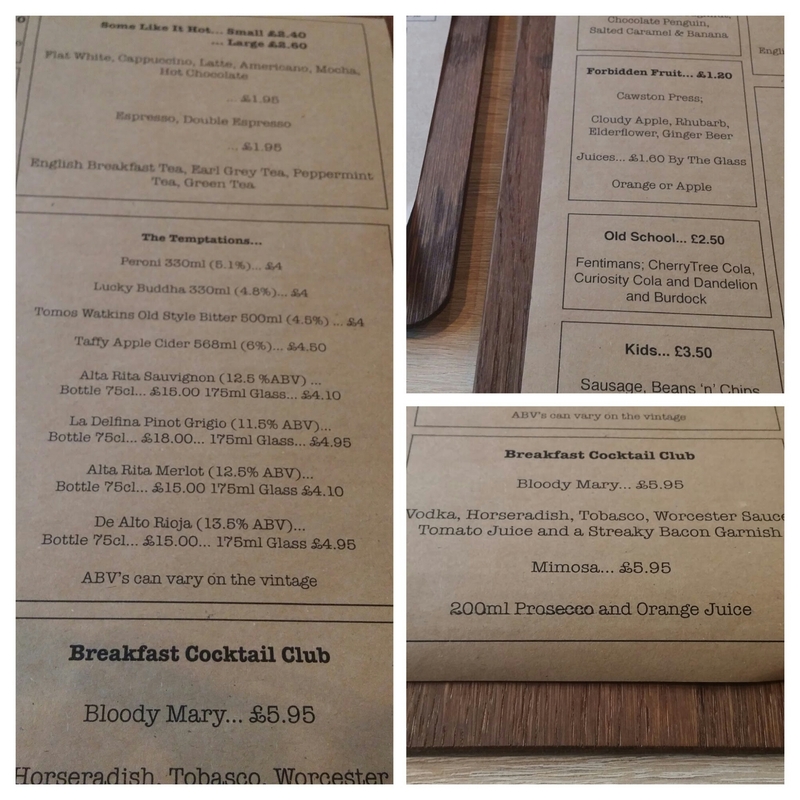 The latter are for those with perhaps somewhat more robust constitutions than me, but I suppose a Saturday morning (pre Six Nations perhaps or the morning after the upcoming France game) Bloody Mary wouldn’t go amiss. We stuck with coffees which were fine. I had high hopes for the all new Servini’s, but regrettably reality fell short of expectation. 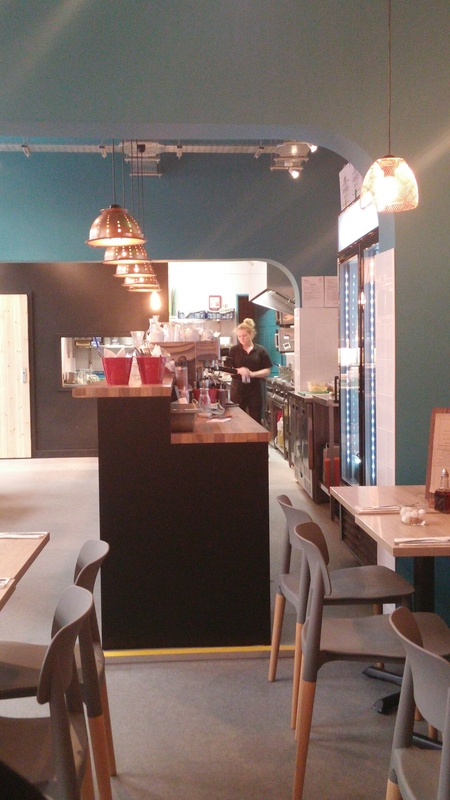 Service was slow and the food when it turned up was flawed in a number of respects. Perhaps this is down to teething problems and these will be ironed out as they bed down (how many clichés did I jemmy into that sentence). Hope so, as it is a cut throat market out there and they will have to up their game if they want to prosper in it. Price wise, I paid £8.45 (for my hash and a large coffee) which would have been decent value if the hash had been better. The idea is right, with a nice interior and a decent looking menu, but it is currently let down by poor execution. Sort that out and it could be good. Would I go back? Not sure – may give them one more go with a hope that this visit was an aberration. Perhaps breakfast is their forte? 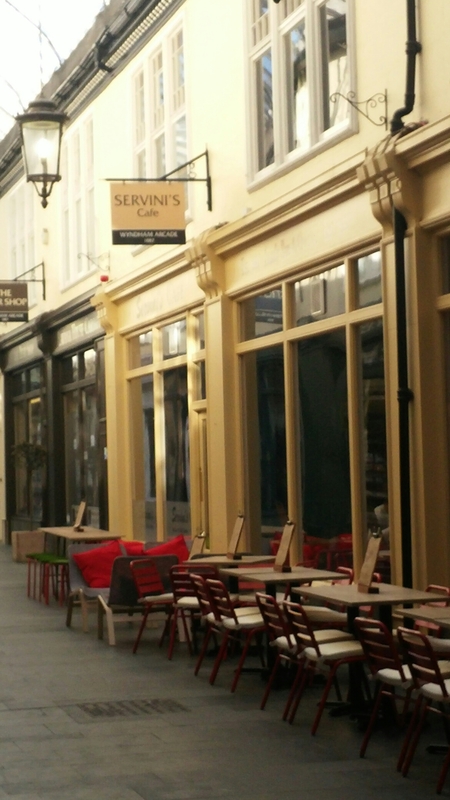 A somewhat late comment but the original Servinis (in a far smaller unit on the other side of the arcade) used to be a regular haunt for me when I was in college and it used to be brilliant. They did a great curry and rice (or arf ‘n arf if you were properly Welsh) and their pizzas were genuinely amazing. I haven’t eaten in the new one for a year or two but it’s just not the same. 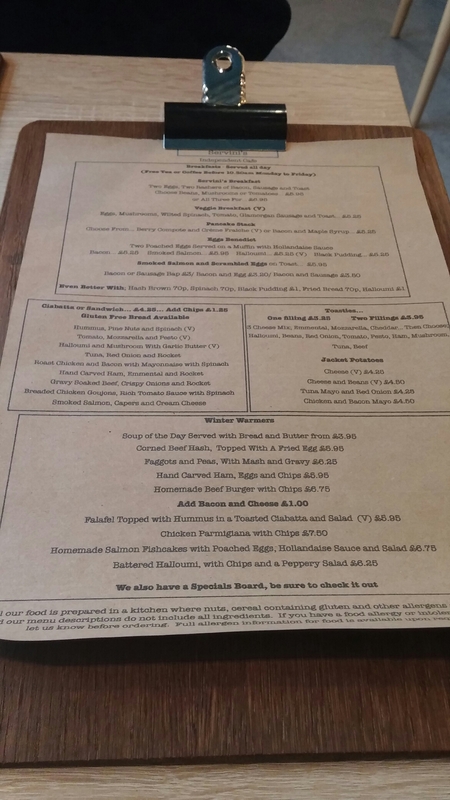 This entry was posted on Feb 21, 2016 by solicitingflavours in American food, Bacon, Beer, Breakfast, Burger, burgers, Cafe, cake, Cardiff, Cardiff restaurant, coffee, Diner, Drink, Food, Food and wine products, New restaurant Cardiff, Non alcoholic drink, review, Sandwich, Wales, wine.